The Dev Anand marathon continues with another one of my favourite films - Hum Dono. That it also stars one of my favourite actresses of the time - Sadhana - is a bonus. I must also confess to changing my mind about Nanda. I'm beginning to like her very much indeed. (Harvey will be pleased to hear that.) A melodious score by the very talented Jaidev, which includes two of my favourite songs, made it imperative that I watched the film again, soon. Unlike, say, Haqeeqat or Hum Hindustani, Hum Dono, which too plays out against the backdrop of war (World War II, in this case), is not as much a 'war' film as it is about the lives of the men who take part in that war, and the people they leave behind. The war, such as it is, is just the backdrop to provide the plot a convenient peg. Anand (Dev Anand) is head over heels in love with Meeta (Sadhana), the only daughter of a a very wealthy man. When the film begins, they have spent the whole day together, but he hasn't had enough of her company, so he importunes her to stay awhile. Meeta wants him to meet her father to speak of their marriage. Anand is hesitant, even worried. He is poor and presently, jobless. His beloved reassures him; come on time, she says, and dress well. Anand has a job interview at 10; he hopes that when he comes to meet her father, he will have a job. Meeta's father (Gajanan Jagirdar) has overheard their conversation, and is perturbed. Anand's mother (Leela Chitnis) is not too happy with the situation either. Her son seems to aiming for the moon. In their present circumstances, that is a foolish thing to do. Anand has greater respect for his beloved - her father may be wealthy, but Meeta is mature and down-to-earth. Meeta's father has also had a respectful discussion with his daughter; they eventually end it with the father being willing to at least meet Anand so he can make up his own mind. The next morning Anand is late, and Meeta's father is already irritated. Meeta is no pushover however; she tells her father that if he's already made up his mind even before meeting Anand, she'll turn Anand away from the door itself. However, her father, wealthy though he is, is not a bad man. He tells his daughter that if he were sure that she would be happy with Anand, he will not stand in their way. Unfortunately, Anand doesn't make a good first impression. He's left the job interview mid-way in order to keep this appointment, and Meeta's father had already made it clear to her that he doesn't have much respect for young men who give up their career prospects for a girl. Besides, as Meeta's father puts it, Meeta has a very romantic view of poverty - a view of someone who is distanced from it. He, on the other hand, has seen poverty at close quarters. He wants no part of it. He's ensured that Meeta has had a very comfortable life, complete with servants, and all imaginable luxury. It is very easy to say that one can live on love and fresh air, but saying it and doing so are two completely different things. Anand's mother learns about it in a roundabout way, and is, quite naturally, shocked. Anand tries to comfort her; after all, one day or the other, he has to stand on his own feet. His mother promptly bursts into tears. Much as he loves her, though, Anand's mind is quite made up. It doesn't change even when his mother is sure she will die waiting for him, nor when she refuses to bid him farewell. By the time she emerges from her grief, Anand has left. Only Meeta is there, a perfect target for her frustrated anger. Meeta had come to look for Anand; she is shocked when she learns that Anand has joined the army. Seeing her, and learning that neither Meeta nor her father had anything to with Anand's decision softens the mother's heart. It melts even further when Meeta asks if she can come live with her; after all, Anand has already accepted her. Will mataji accept her as the bahu? They can both wait for Anand together. Time passes, and Anand, now a fully-trained Captain in the army is fighting the enemy on the Burmese front. This appears to be a short-lived sojourn since the next time we see him, he's shaving. And singing. In any case, he soon finishes both, and makes his way to the Divisional Headquarters. On the way, he spots a wallet belonging to a certain Major Verma. He decides to deliver it when he reaches HQ. At headquarters, however, both he and Major Manohari Lal (Mani) Verma (Dev Anand) are in for a shock. Apart from the Major's mouche and their different hairstyles, they could be identical twins. The happy-go-lucky Major and the more serious Anand are soon good friends, even if Anand doesn't drink, and the Major cannot do without his evening tipple. The coincidences do not end with their looks. 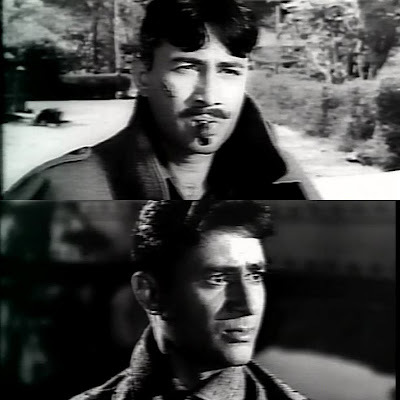 Major Verma discovers that he and Anand come from the same town. Why haven't they met before, queries the Major. The Major has a mother and a wife at home; he confides in Anand that he loves his wife, Ruma, dearly; he even shows Anand her photograph, kept safely in his wallet. Anand, on the other hand, maintains a studied silence about Meeta. Their bonding takes place in the shadows of war, and the Major is in danger of turning maudlin as he remembers those he's left behind. Anand, who can certainly empathise, pours those emotions out in verse. Back in the Major's tent, the Major continues to talk of Ruma; he reads her letter out aloud, shows Anand photographs of Ruma and his mother, and even narrates how Ruma (Nanda) burst into tears when she first saw his marching orders. Meanwhile, back home, Meeta is religiously fulfilling her duty as the bahu. Anand's mother is seriously ill (Has Leela Chitnis ever been anything other than ill in any role? ), and it appears that her last words to Anand may soon come true. However, Anand's salary has just come in, and so has a letter from him. He mentions his new found friend, the Major, and how the Major's mother is being looked after by her bahu; he wishes that there was someone to look after his mother as well. Anand's mother gently reprimands Meeta - why will Meeta not allow her to write to Anand about Meeta staying with her? Why will Meeta not write to him herself? Meeta has her reasons, though. Where does Anand remember her that she should write to him? At Major Verma's house, his letter is also cause for joy - the rumour is that he's slated for promotion; it also appears that the war will end soon, and he will be back. He writes too about his friend, Captain Anand. How his wife and mother will stare when they come back together! Major Verma's optimism is misplaced, however. The jollity and singing and teasing about in the mess are all over. The enemy is advancing. It will take 12 hours for the battalion to get ready. They need one regiment to go forward and hold a critical position until the battalion can move into place. The Major is sure Captain Anand can do the needful, and so Anand is sent out immediately. The Captain strategically places his men, and they await the arrival of the Japanese. A slight miscalculation in the number of trucks and men result in the valiant little force being heavily outnumbered. Their radio is destroyed, and in the mêlée, Anand doesn't see the signal flares that order him to retreat. The Major decides to get the men back; he orders his men to inform HQ about his mission, and to keep trying to contact Captain Anand. He reaches just in time to stop Captain Anand being killed by a sneak attack. He orders Captain Anand to pull the men out. As Anand turns to follow the order, the Major is injured in the cross-fire. Anand quickly pulls him back to safety, and orders the evacuation, asking the men to leave three machine guns behind to provide covering fire. 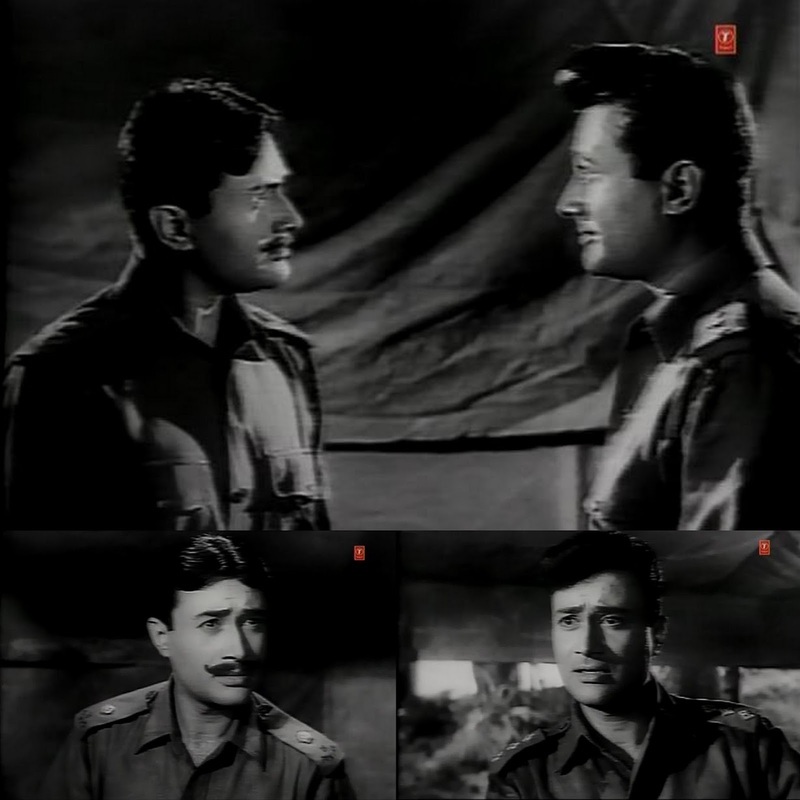 The Major, badly injured, orders Anand to leave. Anand's life is invaluable right now; he will provide covering fire. Not able to disobey a direct order, Anand reluctantly leaves. Just before he does, the Major has a final request: if Anand would consider Ruma his bhabhi, and look after her and his mother? Meanwhile, at home, Ruma, Major Verma's mother, and other army wives, sisters, and mothers, are praying for the safe return of their husbands, brothers, and sons. Unfortunately for Ruma, she returns home to get the dreaded telegram that announces Major Verma is missing in action. Shocked by the sudden news, Anand remembers he has another duty to fulfil. Meeta has informed a son of his mother's death; now it is his sad task to tell a mother that her son is no more. At the Major's residence, the servant who opens the door to Anand mistakes him for the Major. Before Anand can say anything, the Major's mother has overwhelmed him in her maternal embrace. Anand, lost in memories of his own mother, breaks down in her arms. She consoles him, drying her own tears in the process, and tells him that Ruma hasn't been eating ever since she heard the news about him going missing; she's been spending all her time in prayer, and her condition has been steadily deteriorating. Ruma, in fact, barely makes it to Anand, before she falls in a dead faint at his feet. 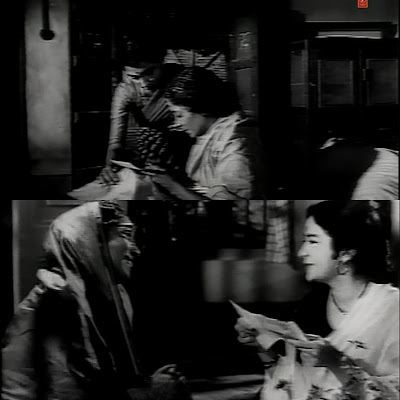 Anand is exhorted to carry her to their bedroom, while the family doctor is sent for. Back at his house, Meeta is waiting anxiously for him to return. Anand is waiting anxiously too, but there are further shocks in store. The doctor, having examined Ruma, has had his long-held suspicions confirmed - Ruma had been complaining of chest pain for the past three months. She's just had a minor heart attack. She cannot withstand any shock. Any emotional trauma, whether happy or sad, can prove fatal. What she needs is her husband's love and care. Anand finally manages to get his disordered senses under control, and informs the doctor that he is not Major Verma. The Major was an unfortunate casualty of war, and he had come here to inform them of the fact. It's his misfortune that he resembles Major Verma. The doctor, initially taken aback, is firm - Ruma's condition is very precarious; she could not bear the happiness of her 'husband's' return; how then will she bear the grief of his death? No, she cannot be told she's a widow. For the time being, it would be better if Major Anand remained Major Verma. When Anand balks - he has his own life - the doctor is unsympathetic. Anand should have told Major Verma that before he took on the responsibility of his family. Now, Anand finds himself trapped in a charade where there are minefields aplenty - he is forced to be friends with men he's never before, a doting son to a woman who is not his mother, and worse, play loving husband to a woman who is not his wife, and who is now hurt by the growing distance between them. How will Anand remove himself from this chakravyuh? Can he absolve himself of a promise made to a dead friend so he can get on with his own life? How far is he responsible for the life of another man's wife? What about Meeta, loyal, steadfast Meeta, who deserves more than this? Hum Dono is still an eminently watchable film, as I discovered when I watched it recently. It is an extremely touching film, focusing on human relationships, flawed as they are, while noting that no one is really inherently bad or mean. They are all people who behave as they do, due to the circumstances they find themselves in. The film made use of its silences very well. Many of the scenes are effective because they are self-explanatory, or make use of minimal dialogues. The scene where Ruma first reads the order calling the Major to the war front, for instance, or the one after Major Anand's return, when even Major Verma's mother accepts him as her son, and only Ruma finds something amiss. Anand tells her Shakl wohi hai, lekin aatma badal gayi. Or the climax where Ruma avows that for her, marriage is between two souls, not just two bodies. The Major, who has been staying away because he's crippled, overhears her, and slowly steps out from behind the pillar. As he turns to face Ruma, the expression on their faces, the slight nervousness coupled with a wordless plea for her love on his face, and the shock and compassion, and yes, love, on hers - it didn't need any exposition; it was perfect just as it was. The dialogues, crisp and to the point, as well as the screenplay, are credited to Vijay Anand. Amarjeet, who was nominated for the Golden Bear at the Berlin Film Festival (Hum Dono was India's official entry), had to counter allegations back home that the film was ghost-directed by Vijay Anand. (For the record, even Dev Anand's autobiography states that the director of this film is Amarjeet.) 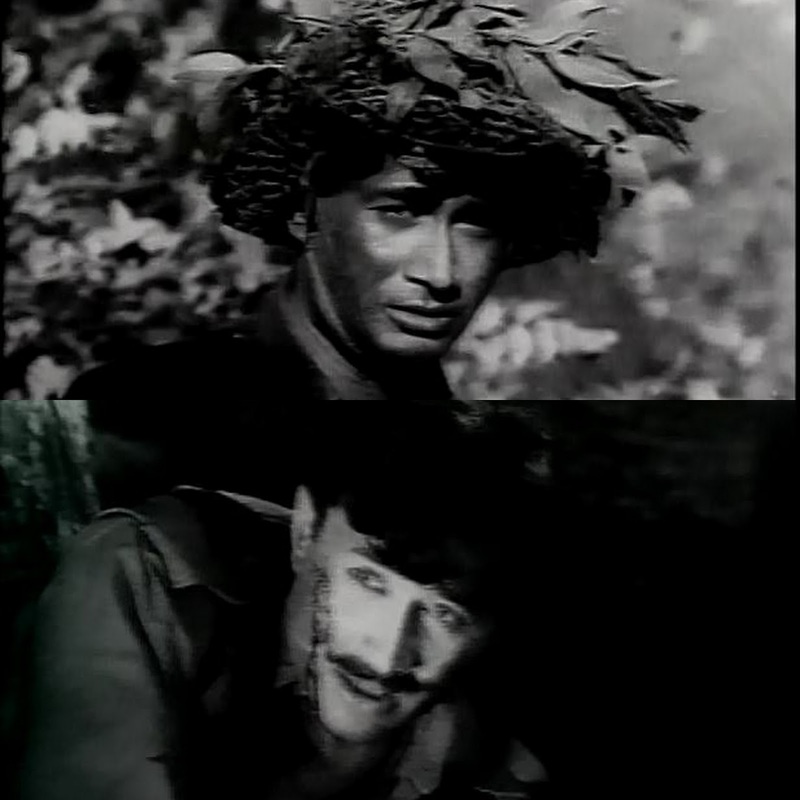 He was assistant director to Vijay Anand during the making of Kala Bazar and Nau Do Gyarah, so it is but natural that his mentor's techniques should rub off on him. 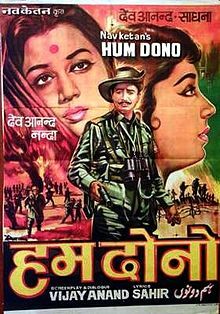 Like all Nav Ketan films, Hum Dono had a stellar score, although Nav Ketan regular SD Burman made way here for an under-rated Jaidev. He gave them six songs - each one of them a classic - that are remembered even today. The war scenes were written by Lt. Col. Montgomery Kee, who had also supervised their shooting. (To me, they were the weakest part of the film.) Since it dealt with the Indian army, Dev Anand also had to commit to the scenes being vetted by the Defence Ministry before the film could be released. In his autobiography, Dev Anand narrates how then-Defence Minister VK Krishna Menon watched the film with his friends and relatives. Dev Anand did a convincing job as two disparate men. As Major Verma, he modelled his character on an army man he had met at the Kirkee Cantonment (near Pune), with a faux British accent and a hail-fellow-well-met persona in tune with his jauntiness. Yet, he brought a certain gravitas to his later scenes, where there is more at stake than just life and limb. As Anand, he's more restrained, slightly insecure, with a complex about his financial situation. As 'Major' Anand, recently returned from the front, he brings out his emotional conflict admirably. Especially when he realises that extricating himself from the charade that he's been forced to play is not as easy as simply confessing the truth - he will not only go to jail for being an impostor, he will leave the Major's mother devastated, and worse, either leave Ruma dead, or with a lifelong stain on her reputation. Trapped by circumstances, he has to choose between traumatising an already frail woman, or wounding his already-hurt beloved. Even his confrontation with Meeta when he believes that she's married someone else rises out of his own insecurity - he cannot believe that a woman who spends more on her birthday than his own monthly income would be happy with him. Meeta is a very strong presence. She is willing to stand up to her father for the sake of her love, willing to face her beloved's mother's recriminations for the same reason, willing to face Anand's lack of communication - all because she believes in their relationship. When Anand remains uncommunicative, she still holds out hope that their love will triumph. She is no pushover, however, telling him off quite strongly when he taunts her about marrying a 'mere Captain'. She would be marrying a man, not his income. Anand is disbelieving - does her father know her revolutionary thoughts? Meeta is justifiably angry - Mere pitaji mujhe tumse zyaada achi tarah jaanti hain. Varna tum burzdilon ki tarah mujhe mile baghair kyun bhaag jaate? (My father knows me better than you do; else, why would you slink away like a coward without meeting me?) Why is he intent on raising the walls of her wealth between them? If he had said one word, she would left it all behind and come away with him. Indeed, she did just that. Ruma is a more traditional character, happy within her little world that comprises her husband and their mother-in-law. Nanda brought a sweetness to the role, and in her own way, exemplified Ruma's strength of character. She's willing to fight for her husband's love; later, believing that he would be happier with another woman, she gives him permission to leave. Like I said earlier, Nanda is growing on me. I have so little to quibble with this film. In fact, much like Kala Bazar, I'm surprised that I haven't revisited it sooner. The film has aged well indeed, since the theme is universal, even if the background is the great war. Human emotions haven't changed much, or at all, and the film can still tug at your heartstrings with its core of emotional conflict. If you haven't already, do watch, preferably in its original black and white.